In this section of the blog we are going to be discussing the benefits of rattan sofa sets and investigating different designs and aspects of the most traditional and longest running type of rattan garden furniture there is. Firstly we are going to have a look at this traditional set of rattan garden furniture as featured on the Abreo rattan furniture website. 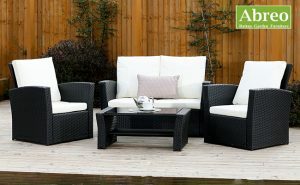 This set as supplied by Abreo is in a traditional style and design but it has a very classic design, which means it will never go out of fashion and will look stylish in your garden for years to come, this type of furniture is usually very comfortable it has a high back and is great if you plan to spend a log time sitting in your garden. 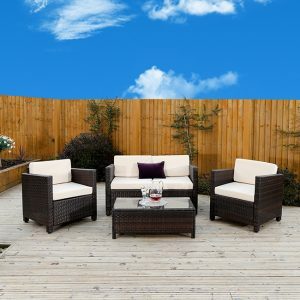 This garden furniture set for example has a matching coffee table that is also made of rattan combined with a dark glass table top, which minimises the amount of cleaning needed as dirt has a tendency not to show up on dark glass surfaces. This type of traditional rattan sofa set actually comes with a free waterproof rattan furniture cover which is a great way to reduce the amount of dirt your set will collect over the winter month. 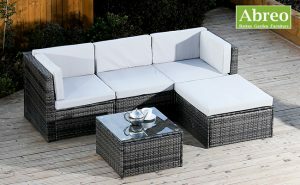 Modern rattan sofa sets have really change the popularity of the traditional rattan garden furniture sofa set in the UK. Once seen as going out of fashion the nest contemporary twist on an classic design has really increased the popularity of rattan sofa sets. Keeping the comfortable relaxed style of the traditional rattan sofa sets with its very chic outdoor cafe style. The modern sets tend to use straight clean lines which will give your garden a very clean and contemporary look. Another added bonus of selecting the simpler modern rattan sofa furniture style is the ability to cover the furniture with a waterproof cover more easily because of its clean simple lines. Its a small bonus but for anyone who has experience trying to fit a cover to their garden furniture in the cold season it is a definite worth while benefit. Modular rattan sofa sets combine the comfortable relaxed seating style of rattan sofa sets and the modern clean lines of the contemporary rattan furniture sets with the the added practicality of being modular, being modular means the furniture sets are made up of separate sections allowing each set to be taken apart and arranged in whatever configuration you like. An example of this can be seen below. 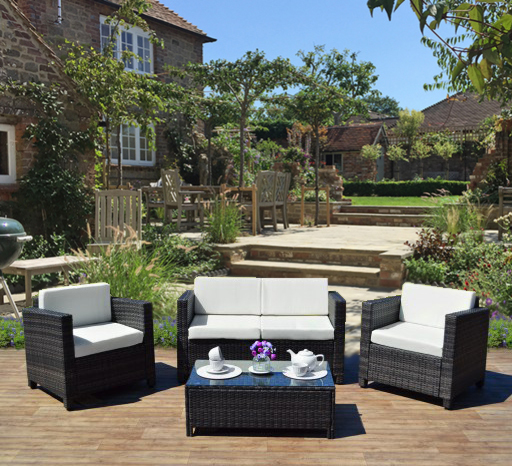 The added benefit of modular rattan sets id the ability to easily move the furniture if you require the need to store your garden furniture inside during the colder months or when you are not using it.